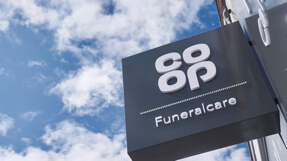 Co-op Funeralcare has been caring for the needs of families in our communities for over 100 years. We'll be with you every step of the way with help, guidance and advice to make sure your loved one is treated with dignity and respect at every stage. Get in contact with us as soon as possible. We can start making arrangements to bring your loved one into our care, offer help and advice on what you need to do, and explain your funeral options. Call us on 01489 787 698 or fill in our online form and someone will be in touch with you to help as soon as possible. Get advice from GOV.UK on what else you may need to do when someone dies. We offer a choice of funeral packages, starting from £1895. We'll work with you to make sure that you get the ceremony you want and explain the costs at every stage.